I live in the Midlands and the local advertising for years has been that Warwick Castle is the finest Medieval Castle in the country. This is no advertising hype. It really is! The castle has been in private hands since the original buildings were started by William the Conqueror in 1068, most notably the Earls of Warwick. It was then bought by the Tussauds Group in 1979 and thence Merlin Entertainments. The majority of the buildings now standing are from the Fourteenth Century from the time of the Hundred Years War and represent a fine example of the military architecture of the time. I’ll come clean. 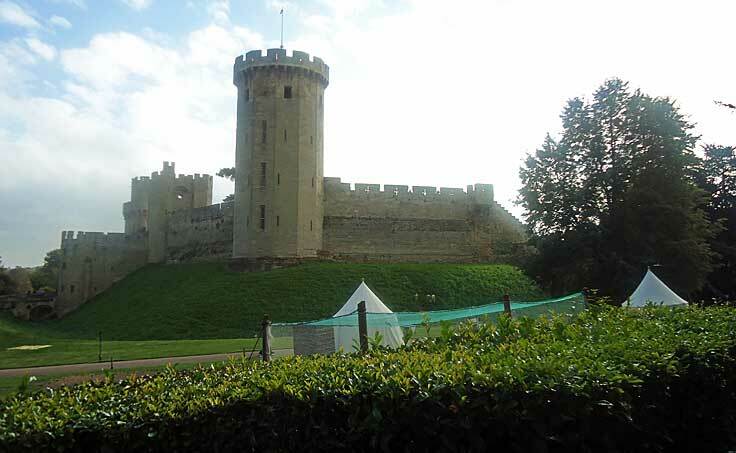 Entrance to the site is expensive but there is a lot to see and there are events such as hawking, firing the spectacular Warwick trebuchet and many more which are included in the price so I suggest you give it a whole day, especially if you are taking children. The trip around the Victorian themed Sate Rooms is a must with their very lifelike mannequins and if you are very energetic you can climb the spiral staircases of the towers and walk the ramparts and battlements. (Beware there are over 500 narrow stairs altogether). There’s also the dungeons for the gruesome and a wonderful Warwick the Kingmaker exhibition. The other good thing is your ticket money goes directly to keeping the castle in good knick and improving the facilities so it will make you feel good preserving such a wonderful piece of history. OK I could go on. (some will say I already have) but it’s the gardens you are here to see. Or rather the topic of this website. There are several gardens along with some parkland for energetic children to run around or have a picnic in. Amongst the most famous are the rose garden which is being faithfully restored in all its Victorian glory. The Victorians loved their rose gardens but personally I don’t. Don’t get me wrong I love roses but in other gardens. A whole area of roses in high summer when in flower is spectacular, if a little smelly for the hayfever sufferer, but very boring at other times of the year when everything is dormant. So the topiarist will head for the tea rooms. 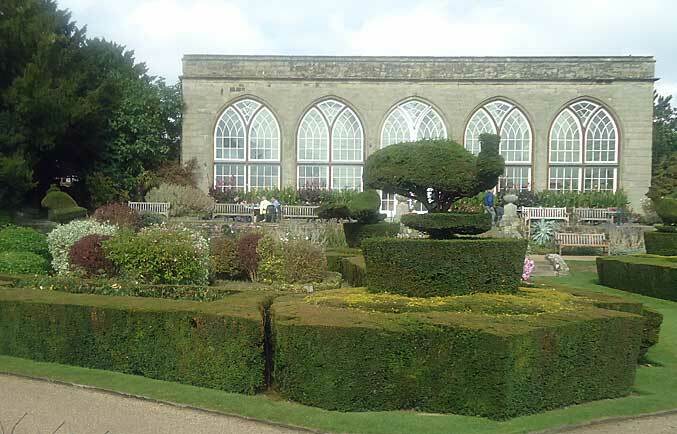 However unlike most normal people the topiarist won’t go into the tea rooms but walk round and gaze at the beautiful yew parterre with the even more wonderful yew specimens of birds. These are interplanted with shrubs and other flowers in the Victorian style but the whole is proportionally very pleasing as the yew hedges are quite thick. If you are faithfully trying to recreate an Elizabethan or Queen Anne style parterre you wouldn’t use interplanting but I think with the right choice of plants the colours can be enhanced when set off against the green of yew and for those with a fairly small plot choosing one of these parterres as an inspiration might be worthwhile to get the best of both worlds. 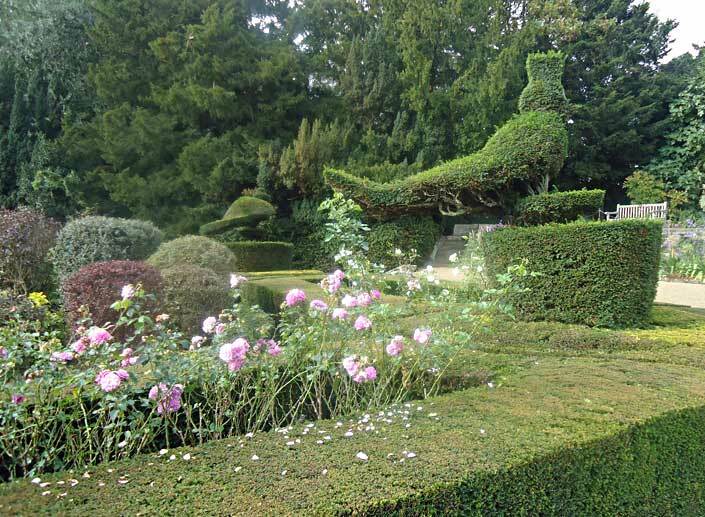 Not to be outdone by its grander cousin Yew there are also some Box parterres in the section with low hedges and pleasing curved shapes for their outline, and yes roses look splendid when planted here. 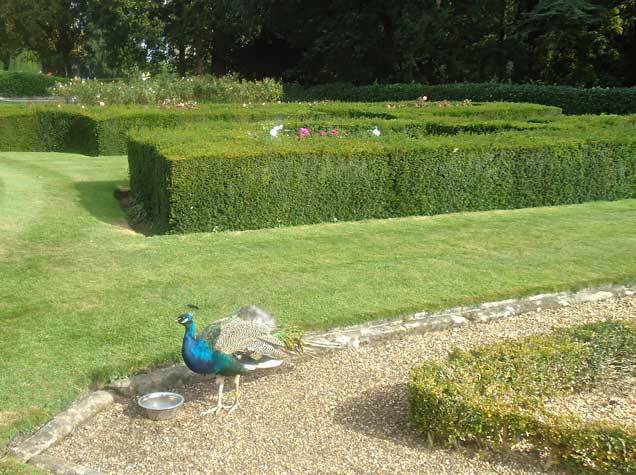 One of the most famous inhabitants of the grounds at Warwick Castle are the peacocks and below is a photograph of them that prove they admire topiary. Mind you it may just be that water bowl put out for their benefit that is the main attraction but there it is. Proof that the peacocks do exist is in the photograph below.. 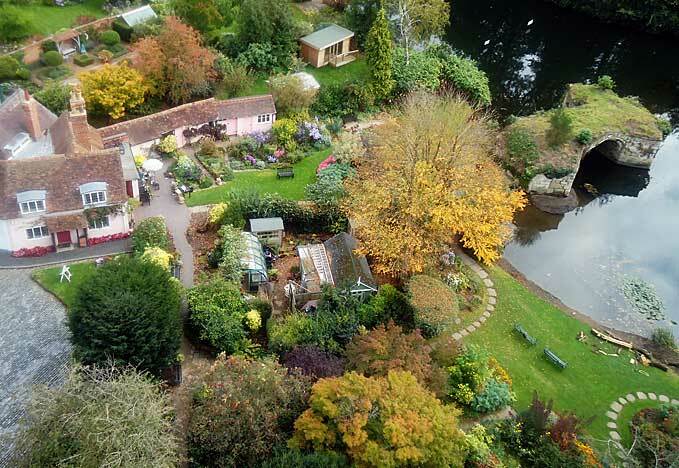 I can’t let Warwick Castle go by without mentioning the Mill Gardens in Warwick and my page on them. If you are energetic the last tower of the many you will climb will give you a view over onto the Mill Gardens as in the photograph below. (take a deep breath and hold on tight before you lean over!) 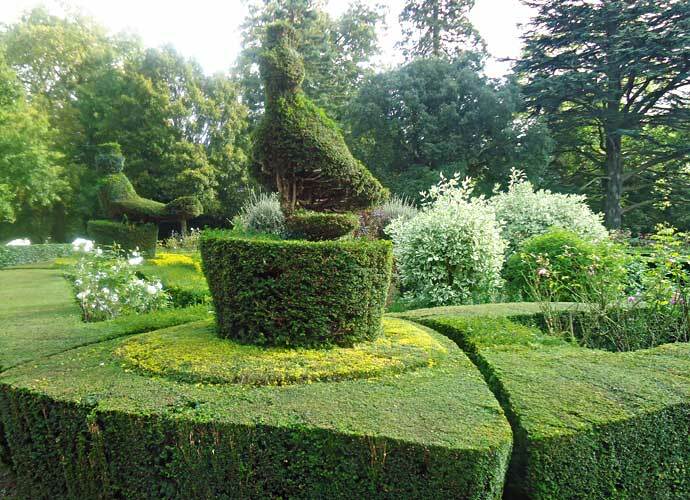 Not known for having much topiary in it but it has the finest view from a garden in Britain in my opinion so go and see.